The ideal solution for extra storage space. Welcome at Caluvan Self Storage in Boortmeerbeek. Located in the centre of the flourishing economic region Leuven-Haacht-Mechelen-Vilvoorde-Aarschot near the airport of Brussels – Zaventem (Brucargo). Our warehouses range from 1m² en 80m². We propose both short (1 month) and for longer periods flexible storage options available to your business that much needed extra space give. Private individuals can also count on us for their excellent service for furniture storage. "Sufficient storage space and a smooth approach to handling in- and outgoing freight transport. Those are the main trumps of a smooth operating company." Our secured building in Boortmeerbeek is equipped with heated, clean and damp-proof storage boxes with surfaces ranging from 1 m² to 80 m². The storage units are accessible exclusively to registered and authorized people. Camera protection, fire detection and access control provide 24/24h optimal protection of your goods. CALUVAN SELF STORAGE offers the service to collect goods in name of the customer during office hours if necessary. Your company lets us know which goods need to be accepted and CALUVAN SELF STORAGE collects them and stores them safely in the storage space chosen by you. We offer all that an E-commerce company needs. CALUVAN SELF STORAGE delivers true service and takes care of a perfect functioning storehouse for you, strategically located in the centre of Flemish Brabant! You will soon be moving and you are looking for a place to store your furniture? 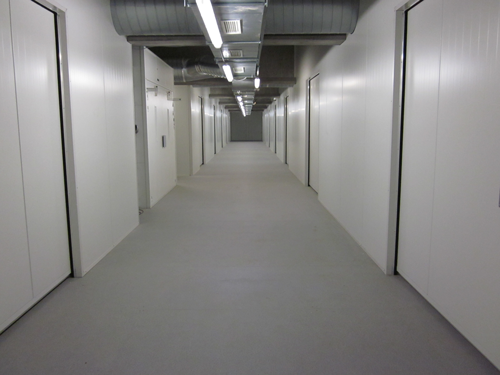 Caluvan Self Storage offers secure and spacious storage units of 1m ² up to 80 m². And in contrast with traditional furniture storage at Caluvan Self Storage Boortmeerbeek you have unlimited access to your goods. During your stay at our storage facilities you can pick up or bring items whenever you want.